This week I’m visiting with my friend in Manassas and suffering from a migraine. Never fun. However, I have a book review for you. There are some other reviews still needing written/posting and I’m attempting to decide the best format as the year draws to a close. I’m hoping for some other interesting things to post, but we shall see how the headache does for me. Before getting to today’s review, I wanted to point you in the direction of my article on the Fredericksburg Patch. I chose to write about Holiday themed reading! What’s the fun of reading if you can’t theme your reading in some way? Now, on to a review, because I have sooooooooo many! Today is a new series for me, the “Dark Elite” by Chloe Neill. Chloe Neill is well-known for the Chicagoland Vampire series, which is also on my TBR. 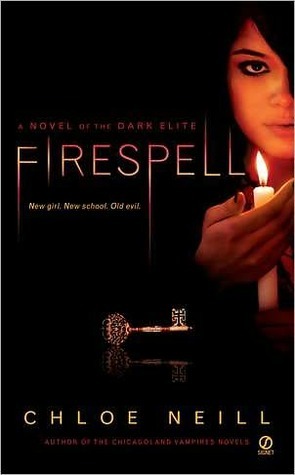 I chose “Firespell” to read first as it is shorter and I only had one book as opposed to more. It seemed the way to go when sampling a new-to-you author. The main character, Lily, sees her parents off on a Sabbatical to Europe and moves from New York to Chicago to attend a boarding school for the final two years of high school. Queue angst now. Luckily, the adventure begins instantly, leaving little time for angst. Enough angst to feel realistic without making you despise the character a la the 5th Harry Potter book. What I liked about the boarding school – it’s old and creepy with secret passageways, hidden rooms, and the like. I dig that sort of thing. If I ever got to design my own house, I would want hidden awesomeness just because it’s funny. Cliche to move a book and see a bookcase swing out, but I like it. Sue me. So what’s the deal? Magic! In Chicago! Reading this, I of course nerd-like imagined Harry Dresden cross overs. Not my fault, I did just recently read “Ghost Story.” The laws of the magic in this series differed a bit, but that’s OK. I did like it. True to young adult fashion – the power rests upon the youth. Save the world, youth! It was a concept I enjoyed reading about. Reading time-wise, this went quickly. Always a bonus in the super busy December season!